Flueless or “no Chimney” Most modern properties have been built without a chimney mainly to save the cost of construction. If you don’t have a chimney then you have a number of options open to you. Flueless Gas Fire – These fires deliver low Running Costs because they are 100% efficient. They have to be easy to use and generate moderate heat. Flueless gas fires are relatively cheap to buy and install when purchasing please ensure that the fire is CE approved and Safe. Balanced Flue Gas Fire – These Glass Fronted gas fires are over 80% efficient, Many sizes and heat outputs are available. They require a balanced flue pipe system installing, size of appliance and length of flue will determine the costs which can be expensive. Power Flue Gas Fires – These use small 54mm diameter pipes and can allow a fire to be installed anywhere as the pipes can run under the floor if required. However, power Flue gas fires can be expensive to buy. 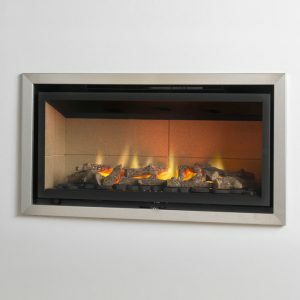 Bio Ethanol Fires – High Running Costs, Safety and Fuel Handling Issues to consider. Flueless gas fires do not require a chimney and can be installed on any wall within a room. 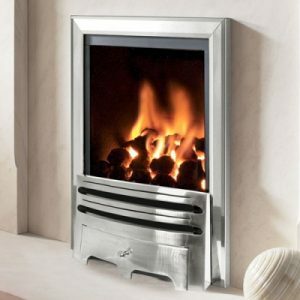 The result is a fire which is 100% efficient with very low running costs for a high heat output. Flueless gas fires can be easily installed into most rooms providing there is a gas supply. You are not permitted to have a flueless fire in bedrooms or bathrooms and the room meets the minimum size and ventilation requirements. You must have an opening window in the room where the gas fire is fitted. If you have a chimney (class 1 flue) you will be pleased to know that we can install, repair and service all types of chimney fires. Pre Fabricated Flues (Class 1 & 2 Applications) These are usually a metal single or twin wall flue pipe connected to a flue box or inglenook, with a terminal on your roof. A flue pipe with a minimum internal diameter of 7” or more is recognised as a class 1 flue and a flue pipe of less than 7″ generally around 5” internal diameter is recognised as a class 2 flue. 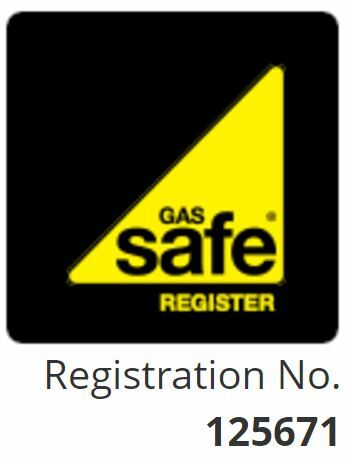 CF Heating can install, repair and service gas fireplaces for class 1 & 2 appliances available dependent on the size of flue and flue box you have in your property. Contact us for more information. Pre-Cast Flue (Class 2 Application) Many new properties that do not have chimneys are fitted with Pre-cast flues. This flue is manufactured into rectangular hollow concrete blocks that travel vertically, up through the cavity wall of your property, to a ridge vent or metal flue terminal on the roof. These flues tend to be very shallow in depth, although suitable deeper, appliances may be able to be installed with the use of either a spacer kit or deeper rebate on the fireplace. We would suggest a smaller hole in the wall type fires. The best solution is a High-Efficiency Inset Gas Fire. We are qualified to install, repair and service all hole in the wall fires and high-efficiency gas fires. Contact us for more information. Power Flue (No Chimney Application)A power flue gas fire uses a fan system on the back of the fire to blow the combustion products through the wall to outside. Sometimes the fan is inside the property, sometimes it is outside. These fires are best suited to homes where there is no chimney. The downside of this type of fire can be the noise created by the fan when it operates. Chris is qualified to install, repair and service all power flue gas fires. Contact Chris for more information.